The scheme shows the intelligence production process the way we define it. It starts with an intelligence requirement which determines the analytical output needs to address in the end. The whole process, its input and output, is embedded by safeguarding measures with regard to classification and dissemination. Collection and analysis are part of the same process which leads from a crude base of input to a result of carefully selected and finished output. 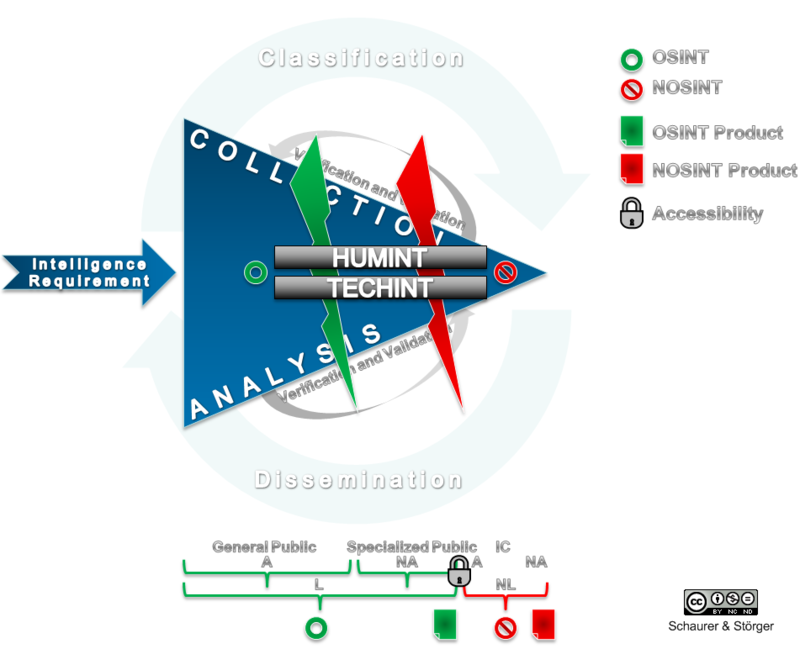 This process entails both HUMINT and TECHINT, the two basic type of intelligence sources and means. At this point we have to admit a little inconsistency because we still use the expressions ‘Human SOURCES Intelligence’ etc. while we usually add an explicit note that we imply also MEANS. This adds another parameter in distinguishing different types of intelligence. For example, human sources can be exploited using technological means. Apart from HUMINT and TECHINT, we distinguish Non-Open Sources Intelligence (NOSINT) and Open Sources Intelligence (OSINT). While the former is available only to government authorities (e.g. the IC, criminal investigations…), the latter is available to the public. By ‘available’ we mean ‘factual and legal accessibility’, that is the public has direct access (or is able to get it relatively easy) to the required sources and means and sbides by law. We also assume that authorities act within in legal boundaries only. We further define two groups within the public: A general public and a specialized public, of which the latter is endowed with advanced capabilities and/or resources (e.g. companies). However, the specialized public does not have extended legal authority, unless given by contractual agreements with private or governmental entities. Both, the general and the specialized public can contribute OSINF and even OSINT (OSINT is open source information – OSINF – enhanced by analysis) in response to intelligence requirements. Nevertheless, only the specialized public is able to contribute something that goes beyond what is available or deliverable by anyone. This stems from our definition, which assumes that the specialized public as well as the authorities additionally belong to the general public. Thus, in theory both of these groups know what the general public knows. Consequently, the general public has no extra information that it could provide to the spezialized public or to the authorities. First, there are obvious interdependencies between these parameters. For example, an extended authority and more resources can lead to building more/better capabilities. Often, in the present reality we observe that the authorities do not necessarily hold more resources and capabilities than private players on the market though. The primary distinctive feature between the specialized public and the authorities therefore is their legal authority, not necessarily their resources and capabilities. This leads us to a second important conclusion that the authorities need to integrate the partial superiority in resources and capabilities of the specialized public into their intelligence production process. Note: The text was written by Jan Störger. This was written by Florian Schaurer. Posted on Tuesday, September 14, 2010, at 20:40. Filed under General. Bookmark the permalink. Follow comments here with the RSS feed. Post a comment or leave a trackback. I felt that we should add some explanation of the above scheme. So I did.